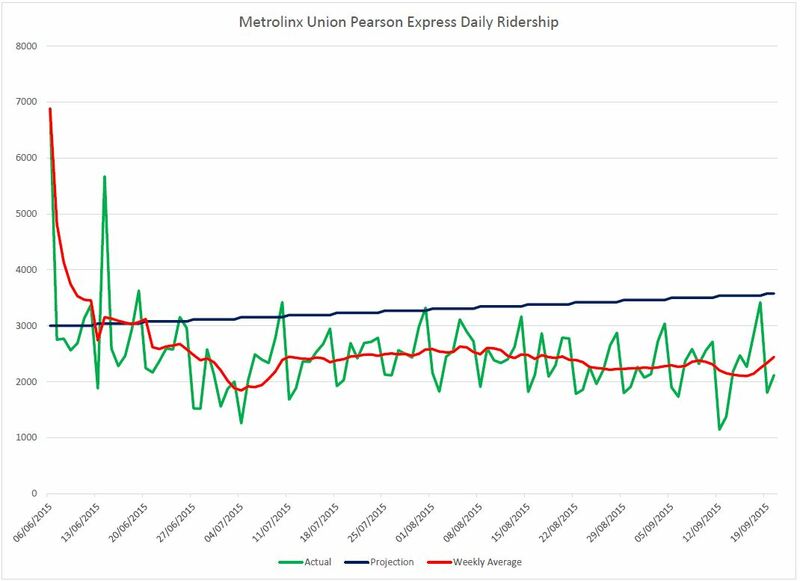 The Metrolinx board meeting for September 22 includes an update on the Union Pearson Express (UPX) and the evolution of its ridership. Metrolinx continues its rosy reports on the peformance of the link to Pearson Airport from downtown. In other words, by next June, UPX expects to be at double its current average daily ridership. That’s a steep growth curve. Notable by its absence from this statement is any reference to the Pan Am Games. UPX may have carried the Games’ Torch into the city, but the same does not appear to be true of the attendees. If we proved our ability to build a “world class” airport link, we actually demonstrated it to a very small world. Also missing is a discussion of UPX operating costs, the distribution of fare types among users (and, thereby, the average fare actually paid per trip) and the break-even point based on actual rather than hypothetical numbers. The history of claims for UPX performance is worth reviewing. During this meeting, Kathy Haley, President of UP Express, stated during her presentation that UPX would reach break-even on operating costs in 1, 2 or 3 years even though her own slide deck claims that the business plan is based on a 3-5 year break-even period. [See p. 10 of her presentation, and 1:35:25 of the meeting video.] This sentiment was not exactly echoed by CEO Bruce McCuaig who talked of a 3-5 year period to reach break-even [see 1:47:50 in the video]. There was even discussion of whether UPX would be overloaded [1:51 in the video] by airport workers getting on the line with a concession fare. The poor understanding by Board members of the demand situation was quite evident in this debate, along with shortcomings of some of the demand modelling. Of the 40,000 airport employees, only 3,500 live in the UPX catchment area. These were expected to generate 500-800 trips implying that only 250-400 employees would use UPX to reach their workplace. Yes, only 1%, at best. The discussion continued with talk of the cost for such commuting on a $300/month pass. In a neat bit of gerrymandering, the comparison was made between the after-tax cost of such a UPX pass and the before-tax cost of GO fares over a comparable distance. Moreover the access time and cost to reach a UPX station via the TTC were ignored. Airport workers, unlike the business clientele for UPX, are not generally in walking distance of a station. Riding was expected to be 5,000 per day which would translate to roughly 1.5-million annually. McCuaig described a growth from 1m rides in the first year’s operation to 2.5m in year 2 and 3m by year 3, the target for a mature state of demand. Whether there actually was any “heightened anticipation” for the service depends on whether you are a UPX acolyte desperate for the chance to ride a new train to the airport at a considerable cost premium over competing modes. The UPX would by Metrolinx’ own estimate attract only about 6% of the air passenger market bound for Pearson. One fundamental issue is that a huge proportion of airport users do not come from the line’s catchment area, and so the potential market is a small portion of the total. Some auto trips may be diverted to transit, but at this scale the effect wouldn’t be noticed in the background effects of congestion and latent demand for road capacity. This update contained no refinement of the ridership projections, but concentrated on the pre-launch activities in construction, training and business partnerships. This update, on June 25, reported that the opening week saw average daily ridership of 3,250 “consistent with ridership projections”. The remainder of the report dealt with start-up activities and continued development of partnerships. A related presentation included a chart of anticipated riding growth for year 1. We now know that UPX is not achieving even its week 1 target, and it has a long hill to climb up to that week 52 projection of 5k riders, let alone the level needed to break even on operations. ← Metrolinx Fare Integration Study: Heading to a Foregone Conclusion? If the ridership isn’t in the catchment areas to begin with, it’s hard to imagine that a reduction in prices would make much of a difference. As far as the concerns of it being a “white elephant’ I’m a bit more optimistic. For one thing, they can reduce their operating budget by reducing the frequency from every 15 minutes to every 30 minutes (thereby halving the number of trains required on the line). I think 15 minutes is excessive when the service is experiencing low uptake. Waiting at most a half hour for an express service that bypasses highway traffic is still very good. Being caught on the 427 and Gardiner during the morning and evening rush commutes are not pretty – especially after a flight. I think they’ll get it right eventually … It’s too bad it’s not doing well. It’s a great service despite the volume issues. The Weston Stn would be fairly well used if the fare was equal to regular TTC, or TTC plus a small premium. This was also a wasted opportunity to return intercity passenger service to Weston on the London and Sarnia/Windsor via Kitchener line and also to connect at Union for eastern Ontario/Québec without using the TTC, GO or…UPX. If I lived in Weston I’d be pretty cheesed about getting to Malton to board my VIA trains. 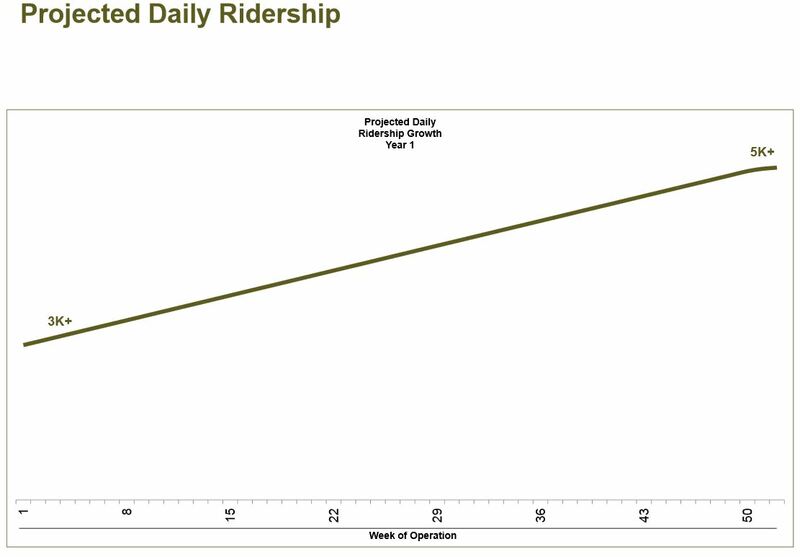 The projected ridership growth graph does not have a vertical scale printed on it, just the start and endpoint values. The 3k figure is about 6 cm above the X axis while the 5k is 14 cm above, at least on my monitor, yours may differ. This is a visual trick to make the growth rate appear better than it actually is. It should only 10 cm above to reflect the change accurately or there should be a scale with a visible cut to show that there is an exaggeration of the vertical scale. The entire attitude presented by Metrolinx to UP Express reminds me of Richard Nixon’s approach to the Viet Nam war: Declare a victory and get your troops out just before the Viet Cong took over Hanoi. If we keep saying it is a success then maybe people will believe it is a success. I don’t like to get into back and forth stuff on the internet but in terms of a comment left by nfitz he/she confirms my direct observations and didn’t read the post properly. Also, “To suggest that Metrolinx is falsifying the data is beyond absurd.” Obviously nfitz has very little experience with Metrolinx. But Michael, if the service were reasonably priced there would not be enough capacity to carry more than 900 pphpd. Jeff. Why are you making slanderous comments? It’s pretty clear ridership is significantly higher than 300 a day. And how can you possibly claim that you’ve seen only trains with 6 people on it, at best. I’ve seen more than that, and I seldom see or ride a train. Other have observed more. TTCRiders did their own count during a low-traffic period, and counted 14 people per train. With 158 trains a day you really suggest that the total ridership in a day is only 300 people? Obviously there’s going to be trains, particularly off-peak, that are pretty empty. Heck, even with the 8000 or so to break even it would only average 50 people per train. I just can’t imagine how anyone could suggest that they are faking the numbers, when the observed count is close the 2,500 reported average. But ask yourself this. If you think they are willing to fake data that it’s 2,500 instead of 300; why then didn’t they just claim 3,000 to meet their target? Commenting that the money or capacity could have been spent better elsewhere is one thing. But I don’t think starting to spin such deceitful tales benefits anyone. So, after only three months of operation, 2 being the summer months, you guys want to start tinkering with this service, ie making it available to the poor, not just the elite and so on? Why should it not get at least a year like everything else? The comments about one person on the train at 1pm are about as helpful as my 20 bus had nobody on it at 1pm…so should we mess with that?, no! give it a chance, I know you all want more, more, more, more, more and more. You are not satisfied even that after decades, we are actually getting a subway ext to Steeles and a Crosstown LRT on Eglinton and then Finch lrt and a ‘whatever’ to replace the SRT. I say whatever because mode means nothing, the fact that new is being built is all that matters. Not enough good news? Steve: The issue is mainly of the relative importance of various infrastructure investments and the dedication of track space/time to a lightly-used premium fare service whose capacity is constrained by the terminal size at the airport. Yes, the sad part is that the “big lie” technique still works. It worked for Goebbels, so Nixon tried it, and it worked for him – so well. If we want a world class airport train, we need world class signage. Do the airport taxis have a seat on the committee that approves Pearson sign changes? My dad flew in last night and said he couldn’t find his way to the UP train at all–he had to track down an agent and ask for directions. Fix the airport signs and the ridership will go up. @robertwrightman, you assume that the graphic is displayed from 0 to 5000, whereas it could be from 1000 to 5000 or any other set. It’s really not informative, and it’s very poorly done because it doesn’t anticipate seasonal variation like there is in Pearson volumes. July/August is the busy season for Pearson with June/September above average (March being the next busiest). If you want to be negative about the UPX, wait until the November ridership numbers come out. The Seasonally Adjusted AADT so far is 2235. With that seasonality in mind, the September numbers actually represent an uptick in usage as a share of total Pearson passengers. Steve: A related problem is that the higher summer airport use is generated by tourism. and this is not the target market for UPX. A better comparison would be to look at submarkets and their seasonal fluctuations. @Jeff, you said you saw 2-6 people per train. Nfitz said he saw 20-35 people in a train. The numbers reported included at the lowest day (a Saturday in September) 1,144 people (7 per train). If you are going to falsify data, at least make it look good. Steve: If the average is 7 per train, then it is quite plausible that some trains would have fewer riders. The problem with any anecdotal observation is extrapolation from “the trains I saw” to “all service”. There are subway trains in Toronto that are nearly empty at some times and locations (more commonly on, but not restricted to, the Sheppard line). Unlike the SSE, the UPX is a provincial project over which the city has no control. Valid point … The Star’s favorite Councilor and spokesperson has minimal use on this matter. Although this provides a great indication that the Star & Metroland media are mainly Municipal propaganda machines. Unfortunate, as this Provincial project is a true boondoggle when compared to building a future SSE and certainly more deserving of an all out media assault. Although your priorities & politics align very close to this party I appreciate that you report on all transit topics in a much more responsible manner. Scarborough is a small if any media voice and has been painted in an ugly light by these folks in many areas. So greatly appreciated. At under 1/3 of the price, the UPX could be twice the boondoggle and still be less of a waste of money than the SSE. The two main differences are that the majority of the UPX investment can be repurposed if it doesn’t work out as a high-end service and that the SSE will be a millstone around the neck of the system like the Sheppard Stubway or the TYSSE; and, there wasn’t an alternative funded plan that would have served more people better until a sense of entitlement was established. I am not assuming anything. I am stating a fact based on observation. Most people would assume that the vertical axis starts at zero and the appearance from the change in the Y axis is that the ridership is increasing at a faster rate than it really is. This is one of many ways to make the ridership appear to be better than it is. Another was saying how much the ridership for August was compared to June without mentioning that June was a partial month. Metrolinx is massaging the information that it is releasing to make ridership appear to be higher than what is happening. A related problem is that the higher summer airport use is generated by tourism. and this is not the target market for UPX. A better comparison would be to look at submarkets and their seasonal fluctuations. While this is true, the ridership predictions used total Pearson volume as the bases, not Pearson business travel. As an aside, the predicted growth of Pearson volumes was highly underestimated. The 2015 target of 36.5M was hit in 2013 and the 2020 target will be hit in 2016, if not this year. Rather than an estimated 1.9% growth, it’s been an average rate of 4.4%. While this is good for the UPX ridership counts, it’s bad for it’s actual market share. One other thing from the May 2013 Ridership Forecast Update, there were an expected 130,000 ADDITIONAL trips predicted for the Pan Am Games, which was the total from July 1 to August 23. I have to say here, I will agree with your premise. I would hope that Metrolinx is spending the time and resources to look at this could be best accomplished now, and is not just trying to sell what a success it is. If the rails could extended out even as far as Malton, and when electrified, also signaled to support rapid transit, even a 3 car EMU every 3-5 minutes would provide far greater value. If this could be pushed as far as the Brampton GO to tie with the Hurontario LRT – it would be huge. I think even a service of 8-10k riders on a rapid transit basis would have a real impact on traffic. Supporting full size GO trains with yet another track would make the combined service supremely attractive, and with a good airport link, also serve that need. SSE is not aimed to serve a broad enough area, with a wide enough variety of destinations to be better than the best alternative, that can be had for similar money, as was the case with TYSSE and the Sheppard subway. We have focused too much effort on serving on a core bound demand. This may be the easiest demand to meet, but there is a need to serve other markets, which the Crosstown is really the first try at – it needs to serve the airport area as well, as does the Finch LRT. The SSE is the classic of a single line versus network, when trying to build transit, Scarborough has many destinations, and more of them need to be served. Interesting article in today’s Post. I have to say however, if it does achieve break even, I would still be hard pressed to call it a success, since, it does not address much more pressing needs, and with a real airport area circulator could have been incorporated as part of a service that did. Even if it reaches its declared goals, it was a mistake. I was at Union on Wed. Sept. 30 and checked out the 18:00 UPX train. It had 28 passengers and a crew of 3. There were 5 employees working at the terminal. No editorial comment, just an observation. So I took my geek ride to Pearson today. It was a great trip. I am surprised at how tone deaf Metrolinx is being around the perception of high fares. With better pricing, I think they could turn it around. It needs to be priced low enough for people to decide to add on the TTC trip (time) to get to and from Union Station. Frankly, price-wise, a cab is more convenient with door-to-door service. As travel guides and websites reflect the concerns over pricing, it will be even harder to change perceptions and increase traffic. As a comparison, how long did it take Heathrow Express to get acceptance from the public in London? Interestingly, there was a separate, less frequent, non-express service that was implemented 7 years later at a much lower fare – Heathrow Connect. There is a stink stuck to the UPX with the fare structure – if you’re in a group of 3 or more, a taxi becomes much more enticing. I have taken UPX twice. The one time on the August long weekend, they had track repair which had no signage or information. The trip ended up taking almost an hour close to midnight on the Monday night. Since I’m not in an optimal location for the UPX service (St. Clair West), I often take the subway + 192; or connect to a GO bus 34 at Yorkdale. This has come a long way since I sat in the big church in Weston ten years ago when some of the first plans were first presented. What would the cost be to have an entrance to the airport spur from the west side over Goreway and the creek? Brampton to Downtown with a reverse in/out at the airport. Then there could be intermodal connections at Brampton GO, Bramalea, and Malton for many airport employees. But that’d blow up the business model (some might also say some of the pretentiousness) … so I guess not. Let’s be frank – Metrolinx is tone-deaf to the issue of fares, as is the political class, because both of these classes of decision makers are likely upper-middle class or affluent, and a few extra bucks matters to them. It’s not just the affluent who fly in this day and age, and therefore it’s a mistake to think that just because it goes to an airport, the potential ridership has money to burn (and/or the desire to burn it). Also I’ve used Heathrow Express and there’s two-person discounts (50% off the second person on a single 2-person voucher) and family discounts that help to make it more competitive with, say, all piling into a single taxi, and Metrolinx/UPX would be wise to consider these types of “deals” to better compete with other options. Yes – it shouldn’t be as cheap as a TTC Fare, but also not exponentially higher. Steve: It would be amusing to know whether there are limitations within the Presto system that make the type of ticketing Heathrow Express offers technically impossible on UPX. What makes you think a lower price point with higher ridership would generate more revenue? $19 x 5000 people is still more than $9 x 15000 people (-$2.80 for a TTC ticket).